"Carlin, Humboldt River Basin, Elko County, Nevada ... Carlin, the oldest town in present Elko County, was established as a railroad division point in December, 1868, by the Central Pacific Railroad. It was named by Central Pacific officials after William Passmore Carlin, a Union officer who served his country with distinction during and after the Civil War. 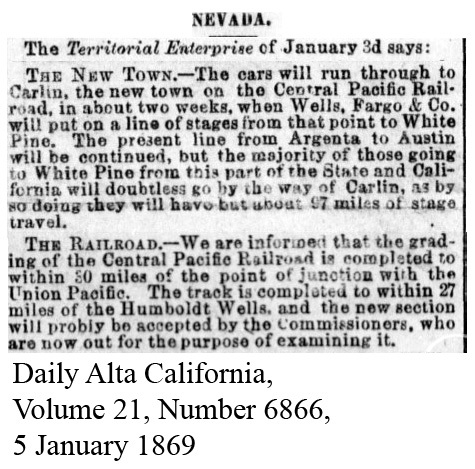 When the railroad construction crews reached the Carlin Meadows, always a favorite stopping place for wagon trains along the California Emigrant Trail, a townsite was laid out, and a large roundhouse and shops were erected. ... "
Thank you for the reply. Unfortunately, we know it was in December but not the exact date. There are several dates referenced but they are conflicting. 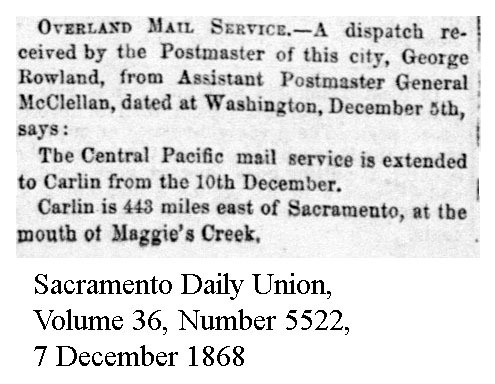 To further complicate things the United States Post Office uses December 4, 1868 as the establishment of the post office in Carlin but we do not believe that would have happened until after the tracks were laid. 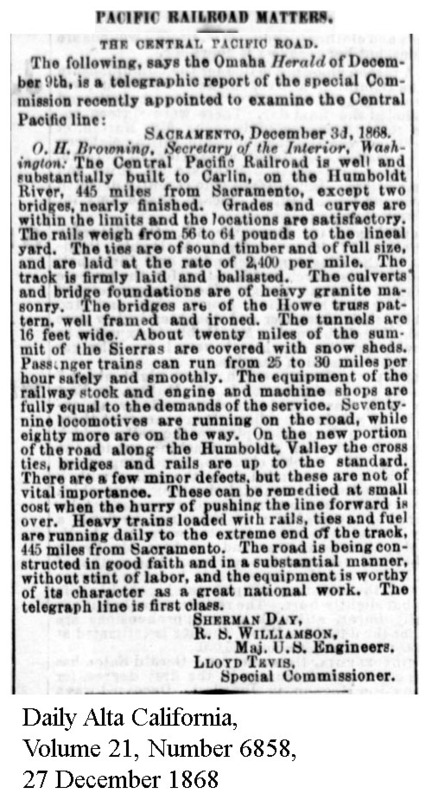 This is why I am trying to find the railroad records regarding the specific days the tracks were laid. 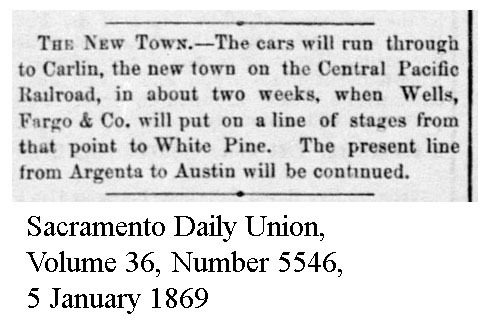 a) 1869-1-5 New Town of Carlin - Sacramento Daily Union, Volume 36, Number 5546, 5 January 1869.
b) 1869-1-5 Carlin new town, Wells Fargo service, CP & UP progress - Daily Alta California, Volume 21, Number 6866, 5 January 1869.
c) 1868-12-30 CP passenger trains now running to Carlin - Sacramento Daily Union, Volume 36, Number 5542, 30 December 1868.
d) 1868-12-17 Central Pacific Progress; Rails laid 12-15 miles beyond Carlin; Wadsworth Shop buildings not yet started - Sacramento Daily Union, Volume 36, Number 5533, 19 December 1868.
e) 1868-12-10 CP mail service extended to Carlin - Sacramento Daily Union, Volume 36, Number 5522, 7 December 1868.
f) 1868-12-3 Central Pacific reported nearly complete to Carlin, except for two bridges nearly completed - Daily Alta California, Volume 21, Number 6858, 27 December 1868.